Empty olive oil bottles provide excellent fodder for several DIY craft projects. Create two different types of lamps from olive oil bottles, or try making an attractive vase—either with simple, safe craft skills or with more elaborate and risky techniques. Small bottles make good paperweights: Fill them with sand or stones for a simple desk ornament, a great gift for fathers or friends. Large bottles can serve as handy kitchen containers for drinks, broths or cooking grease. 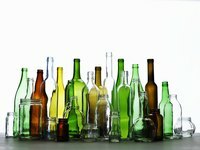 According to Make-Stuff.com, commercially available kits enable the average person to convert an old bottle into a decorative light. Make an excellent lamp out of olive oil bottles with stable bases. Purchase heavy, narrow craft materials such as marbles and sand from a craft store, and fill the bottle with these objects. The light bulb assembly will come with a cork that fits the neck of the olive oil bottle; attach the assembly on top of the bottle and acquire a suitable shade. A more advanced version of this project involves cutting or drilling a hole in the side, near the bottom of the bottle, to allow the cord to pass through the bottle and come out the base. Most glass cutting methods involve heating then immediately cooling the glass before attempting to penetrate through its surface. Be patient and careful when drilling glass, and use a diamond drill bit; this helps to avoid shattering. Another type of bottle light can be created without a kit. In this second type, the light shines from inside the bottle, giving an effect more suitable for party lighting, especially with olive oil bottles which are often a colorful green shade. To create this lamp, use a string of Christmas lights, also known as rice lights; fill the bottle with these. Either run the cord through the neck, and put a shade over the top to hide it, or drill a hole in the base, as above. Vases provide an easier craft project to make from empty olive oil bottles, and some of the beautiful bottles that carry expensive brands of olive oil can make wonderful vases. When making a vase from an olive oil bottle, first remove the cap assembly. Some brands of olive oil have metal caps and glass necks; others have plastic caps with both the lid and the cap base made of plastic. Remove the plastic cap base with pliers before making the bottle into a vase. Decorate the vase by glass etching or by gluing. Always use caution with glass etching solution. According to Oklahoma State University, Armour Etch glass etching cream (available from craft stores) contains hydrofluoric acid (HF); never allow it to contact your bare skin, use eye protection and ventilate the room. Use adhesive for a much safer way to decorate an olive oil bottle for use as a vase. Collage with magazine scraps or pieces of handmade paper. Run a ribbon around the bottle in loops, and glue it in place. Even try attaching shells, pieces of wood and glass baubles in this fashion. Empty olive oil bottles also make good containers around the kitchen for other items. Clean out large ones with soap and water and use them as iced tea or broth containers for the fridge; smaller ones might store fryer oil or meat drippings for reuse. Use sand, small stones and glass baubles to fill up small bottles for use as paperweights. Stop up the neck with wax, or simply replace the cap.